A sage is one who is distinguished by wisdom, gained through reflection and experience. As a horse sage, I’m not claiming to know everything or always be right. Far from it! 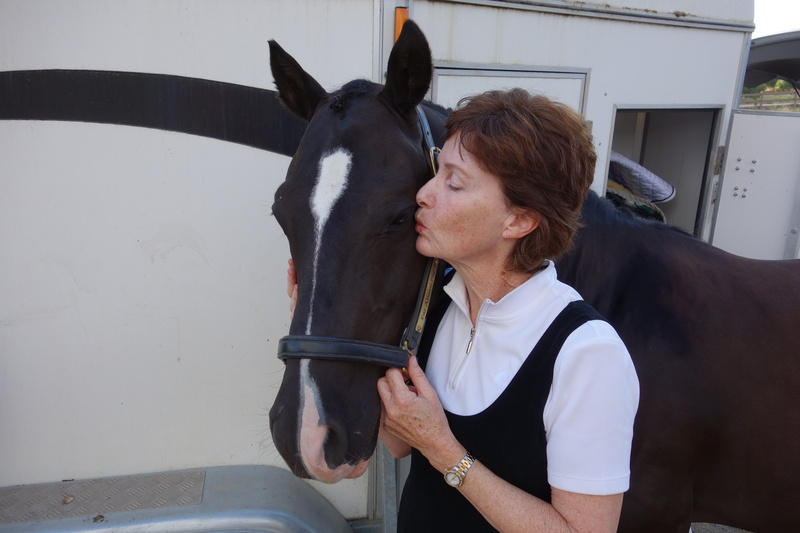 With decades of horses in my life, and many horses loved and lost, I’ve learned some things over the years. I’m still learning and I’ll share my thoughts with you. However, as Oprah would say, “One thing I know for sure”: Time with a horse renews us, body and soul. Get out there and spend time with your horse. Sportscar Finn (“Far Above Par”) in his winter clip, doing counter canter, I think. Normally he’s black. ponies who are zippy and fun. Far Above Par (“Finn”), an amazing dressage New Forest Pony, was mine for a little more than two years and he helped me earn my USDF Bronze medal in just two shows! We then proceeded to master Third and Fourth levels and to dip our toes into Prix St. Georges. However, my back was getting worse and I really needed a softer gaited horse if I was going to have a long riding career. I found Finn the perfect new partner and regretfully kissed him adieux. I appreciated Finn’s larger than life personality, athleticism, incredibly cute face, and his patience in teaching me for two years. Eliana, the haflinger you’ll see in the blog, was mine from age 3 to 10, and is a beautiful blonde girl who loves trails and jumping. In 2015 when my chronically bad back started getting more cranky and said, “no more jumping!”, I found her a fun and caring new owner and they are thriving together. I miss her still; she will always have a piece of my heart and I treasured our adventures together. Oh Ellie. You will always be my baby. In March 2016, and after considerable searching, I was incredibly lucky and found Starlight, a 2010, 16.1 hd PRE Andalusian mare (below). She is that rare combination of very forward to also safe and not particularly spooky. She’s also very soft to sit! While somewhat green at this point, she is athletic and talented and I expect she will make quick progress in her training and I hope to show her as far through the FEI levels as we can go. Right now we’ll start with training level because she has not shown at all. I’m enjoying getting to know the breed and already I love her sensitive, kind, and willing nature. I hope that we will have many, many years together. 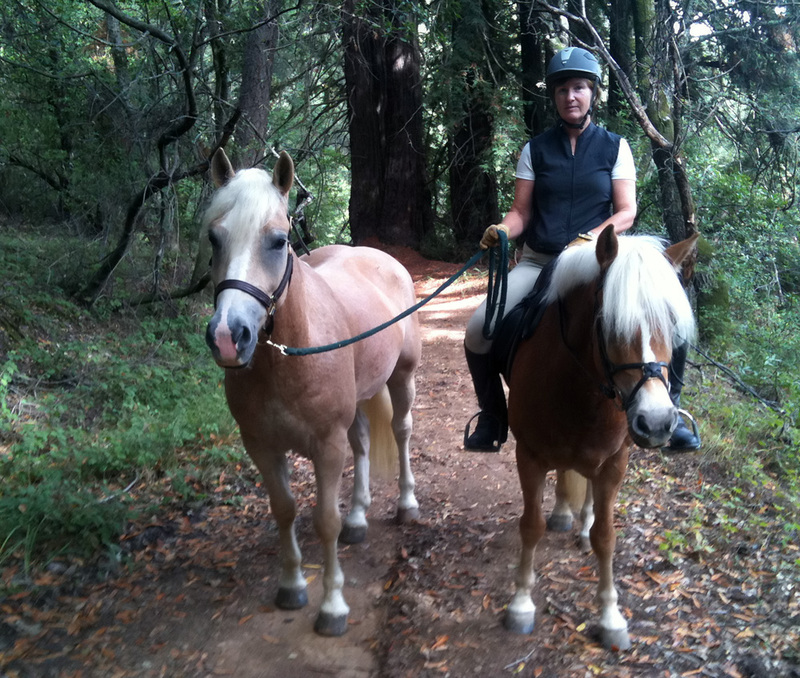 Ellie ponying a young Haflinger buddy in nearby Wunderlich County Park amidst the redwoods. Congrats! I’m so glad you are sharing all your knowledge and wisdom! I look forward to more posts! Love the website! I’m so glad I found your site. I am 63 and just started the joys of leasing about 3 months ago. Although I’ve been riding for 50 years, I feel like I am only really learning now how to ride. Mostly do dressage and also had a PTSD moment a year ago when the horse i was riding wouldn’t stop galloping. Gradually getting my confidence back with an awesome trainer. Will enjoy following you…. Hi Mary, welcome (back) to the joys of riding! So glad to share the journey with you. I think you’ll find a lot of us can empathize with the PTSD moments. May you have many more moments of joy and peace with your horse. We’re so lucky to get to do this, aren’t we?